Trade paperback edition of “The Coronation of Prince Malock” now available from Amazon and CreateSpace! Hi, everyone! 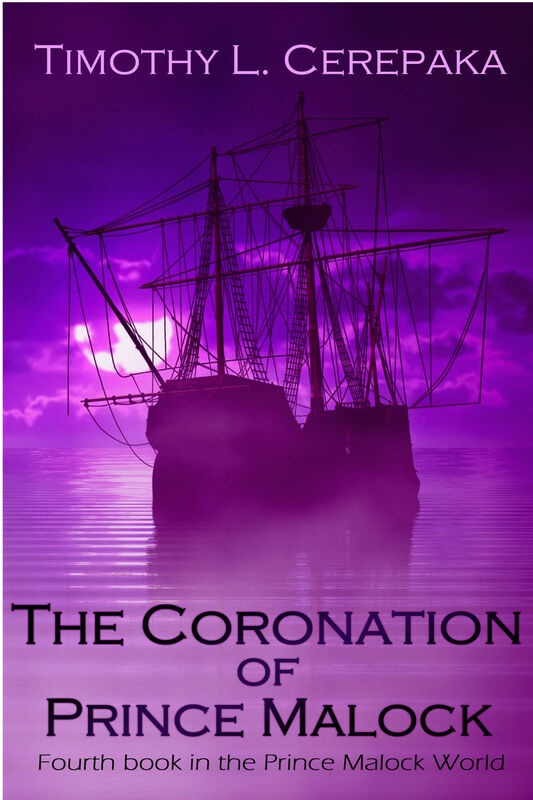 Just wanted to let y’all know that my newest novel, The Coronation of Prince Malock, is available in trade paperback edition from Amazon and CreateSpace for $19.99. So if you’ve been waiting to get the trade paperback edition, now’s the time to do it. Could make a GREAT Christmas present for the fantasy lover in your family or among your friends (just make sure to pick up the first three books as well, which are also available in trade paperback from Amazon and CreateSpace, if your friend or family member hasn’t read them yet). 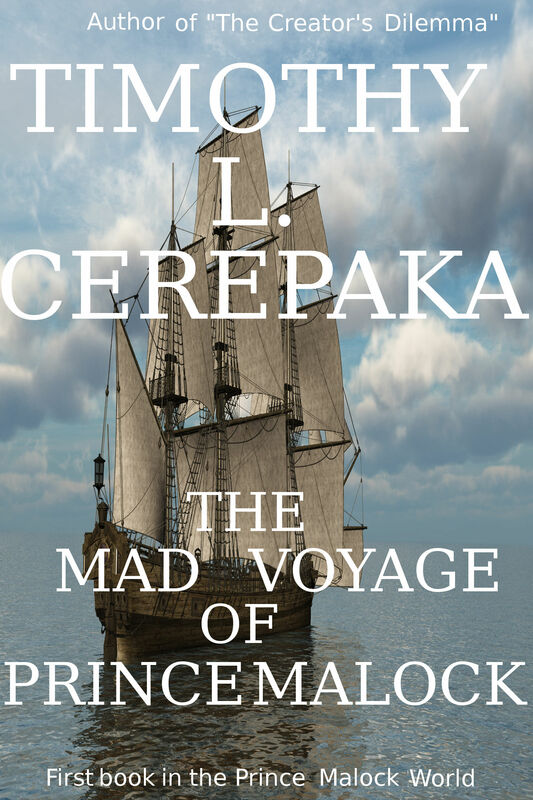 As some of you may know, back in June, I released my first novel, called The Mad Voyage of Prince Malock in ebook form on all major ebook retailers. A couple of months later, I released a trade paperback edition from CreateSpace (links to both editions under the Prince Malock World tab above). did not come out all that well. So I hired a cover designer to do the covers for the rest of the Prince Malock World series (you can see his work by clicking on the Prince Malock World tab above). Very interesting and eyecatching, yes? 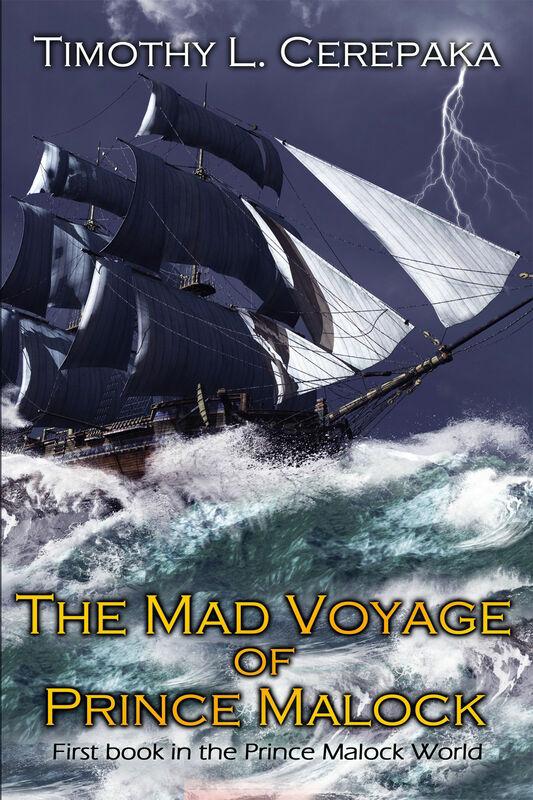 “A mad voyage. A deadly sea. A prince who is determined to conquer both. No mortal has ever sailed to the end of the world and returned to tell the tale. Legend says that the southern seas are full of dangerous sea creatures, lethal storms, and monstrous entities that even the gods cannot imagine. Only a great fool or a brave hero would dare to venture into these deadly waters, much less in response to the summons of a deity he has never even met. Prince Tojas Malock is determined to cross the southern seas, even at the cost of his own life. To answer the summons of a goddess he does not worship, Malock recruits the finest crew money can buy: an intelligent but haughty mage, a young woman with a mysterious past, a fisherman with a secret, and an aquarian woman who knows far more than she lets on. With his ragtag crew of sailors, Malock sails to the world’s end, prepared to overcome whatever the southern seas may throw at him. Personally I think this blurb is better than the old one. A lot more interesting and exciting, in my opinion, which is always a good thing when writing a sales blurb for your novel. However, I have not yet uploaded the new cover onto all of the sites, nor have I uploaded the new blurb. Rest assured that I will get all of that done over the next day or so, including getting the new cover on the trade paperback version. And yes, the trade paperback version of The Coronation of Prince Malock, the fourth and final book in the series, is on its way. I simply haven’t received the proof from CreateSpace yet, but as soon as I get it and read through it to fix typos, formatting errors, and the like, I will definitely announce I purchase here on this blog. Trade paperback edition of “The New Era of Prince Malock” is now available for $16.99! 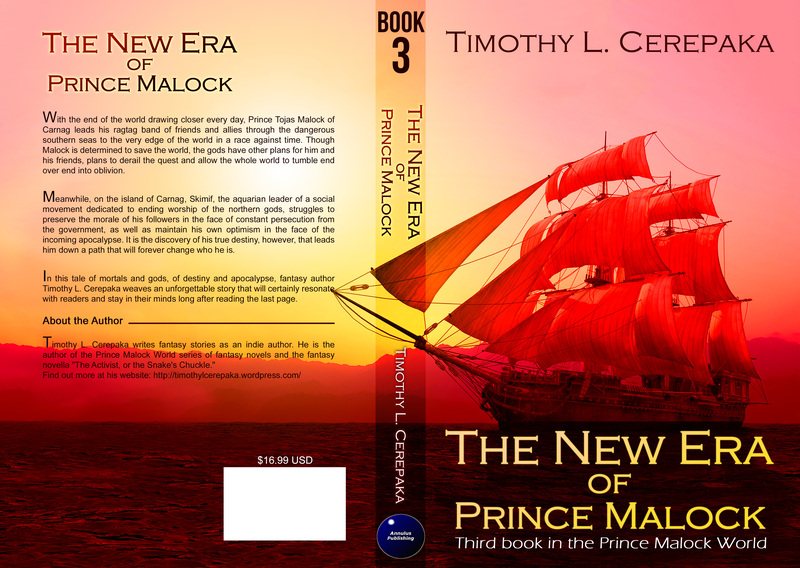 I am pleased to announce that the trade paperback edition of my newest novel, The New Era of Prince Malock, is now available for sale from CreateSpace and Amazon for $16.99. If you don’t like buying from CreateSpace or Amazon, don’t worry. Just go to your local bookstore and ask them to order you a copy. They should be able to do it. Also, if you buy the trade paperback edition new from Amazon, you can get the Kindle ebook version with it absolutely FREE! Since the ebook version is $6.99, I think this is a pretty good deal if you want to get both versions but don’t want to spend $24 for both of them. 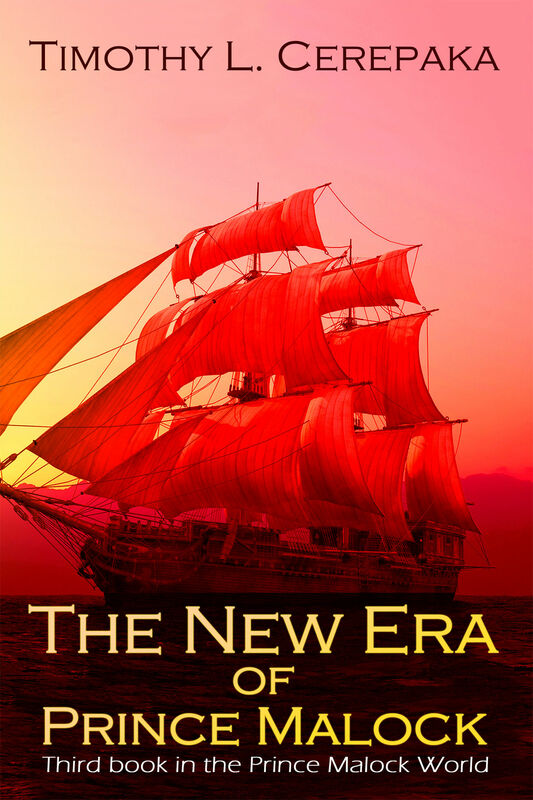 Yesterday was the release of my most recent novel, The New Era of Prince Malock, in ebook form on all ebook retailers for the fair price of $6.99, which you can read about here. In that same post, I promised to reveal the full-sized print cover today, a promise I intend to keep by writing this blog post. Pretty cool, huh? Like the cover for The Return of Prince Malock, it was designed by the awesome (and affordable) fiverrcreator on Fiverr. As you can probably tell by glancing at the cover*, the full price for the trade paperback edition will be $16.99 USD. Slightly pricier than the last book, but it is longer, so I feel the higher price is justified. The trade paperback edition will be made available from CreateSpace, Amazon, and bookstores everywhere next month. I’ll announce its release here when it happens, so stay tuned for that. Also, on Halloween, I will officially reveal the title and (early) synopsis of the book I will be writing for this year’s National Novel Writing Month. I will also discuss the future of the Prince Malock World series after the publication of the fourth and final book in the main series, The Coronation of Prince Malock, which is set for release in December if all goes as planned. Again, please stay tuned. *Sorry if the back cover blurb is a bit unreadable. It’s exactly the same sales blurb as the one I featured in the last post, so there’s not much new to read. 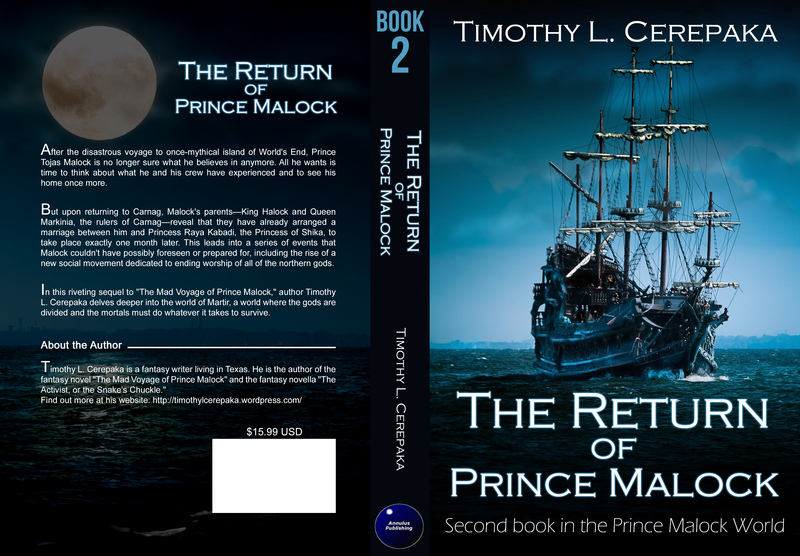 I just added my newest novel, The Return of Prince Malock, to the “Prince Malock World” page above, which you can see by clicking here. You’ll have to scroll down a bit to see it, but the cover, blurb, and links to all of the stores you can buy it from are all there. Also included is a short blurb for the third book in the series, The New Era of Prince Malock, which is set to be released November 2014 in ebook form and December 2014 in print form. Pretty cool, huh? It was designed by the brilliant fiverrcreator. Highly recommend his services for any indie/self-published author looking for a skilled cover designer at an affordable price. The print version will be available in October via CreateSpace, Amazon, and other bookstores and will be priced at $15.99 USD. Can’t wait to hold it in my hands. Anyway, that’s all for now. Though if you want to be informed about the release of The New Era of Prince Malock when it comes out, you can subscribe to my newsletter HERE, where you will be the first to know about all of my new releases before anyone else.